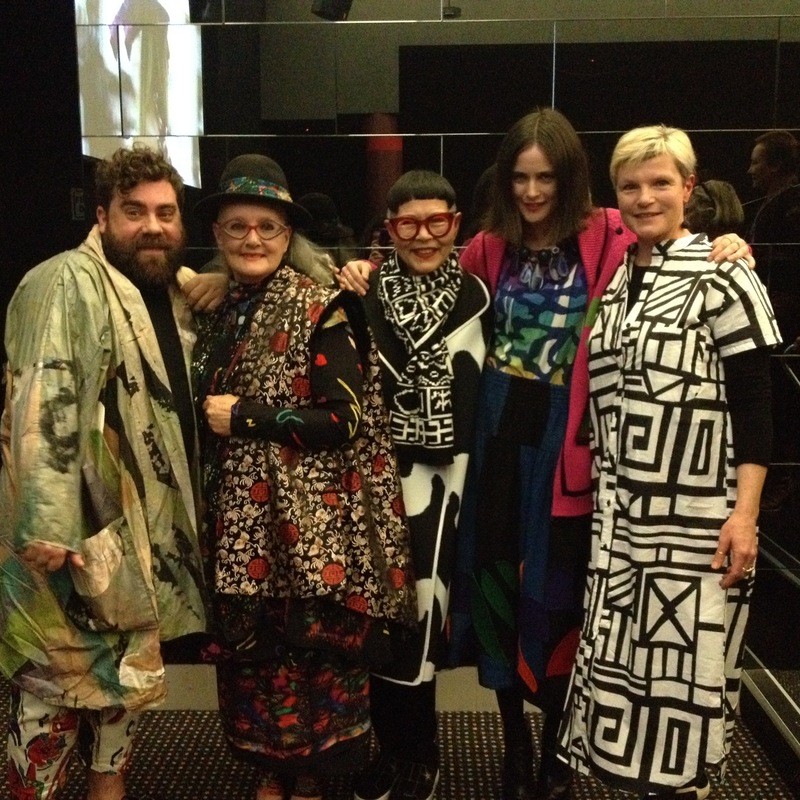 Fashion lovers thronged to the Powerhouse last week for a chat between me and four of Australia’s most fabulously creative and inspiring designers – Linda Jackson, Jenny Kee, Anna Plunkett and Luke Sales. Interestingly, this quartet of extreme talent has collaborated in various configurations and incarnations over the past 4 decades – first it was Linda and Jenny with their iconic label ‘Flamingo Park’ in the 70s, then it was Luke and Anna with their label ‘Romance Was Born’, then it was Jenny and Romance with her 2012 Australian Fashion Week show, and most recently, Linda and Romance with ‘Coo-ee Couture’. One way or another, they’ve all worked with one other and the results have been nothing short of ground-breaking. So what is it about them that clicks? What is that mysterious common denominator? Is it their love of colour? Their flamboyant sense of style? Their passion for dressing-up in wearable art? Can we even pin it down? Luke described it as a fearlessness, while Anna called it freedom. Jenny said it was colour and Linda spoke of beauty. It’s just something that resonates with these kindred fashion spirits and as we spoke about it, another thing emerged; a great sense of humour. I would’ve been about 12 when I went to my first Flamingo Park fashion parade at the Bondi Pavilion theatre and I remember being completely bedazzled by the gorgeous girls, the fantastic frocks, the music, and really just the theatre of it all. That theatrical flair is also very present in the Romance runway shows. Luke and Anna met while they were doing a fashion course at East Sydney TAEF. They ended up doing assignments together because they had a similar aesthetic. They also realised that they were each other’s competition so they decided it was better to join forces than compete. They famously turned down internships with John Galliano to launch their own label 10 years ago and thus began a match made in creative heaven. There’s a little yin/yang sign on their website tab, a reflection perhaps of the nature of their partnership? All three women are pretty dedicated Buddhists. But what about Luke? I asked him if he has a philosophy on life that hooks him in to that side of their personalities – a spiritual dimension, if you like? “Well, I’ve been getting into ceramics lately” he said, adding that he had developed a special relationship with gum leaves. Australian flora and fauna have been part of Linda and Jenny’s work since the ’70s. Jenny was Linda’s muse back in the early days. She delighted in dressing her up in scribbly gum frocks and taking photos of her in the bush around Jenny’s home in the Blue Mountains west of Sydney. I asked Jenny if she could see see shades of that same dynamic between Luke and Anna that existed between her and Linda back in the day and she said she definitely could. That creative competition is all part of the spice, the frisson, the excitement of playing with your soul mate and creating something magic. Anna is also Luke’s muse and whilst one might imagine that the dynamics of the artist/muse relationship are not always smooth sailing, Luke confessed they hardly ever fight. 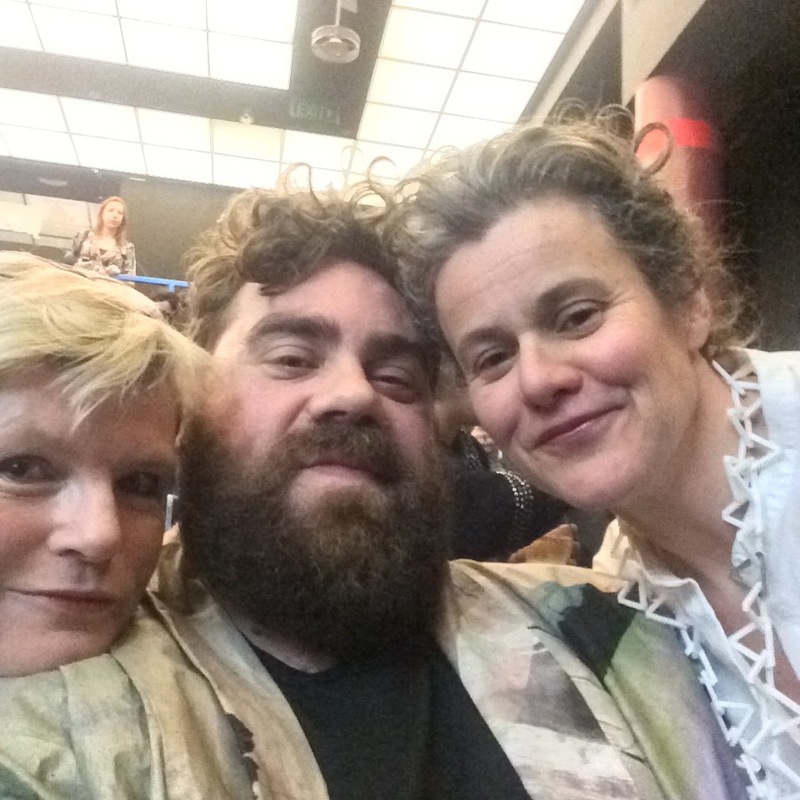 Romance Was Born styled Jenny’s 2012 Australian Fashion Week show of silk scarves and earlier this year they encouraged her to revive her famous knits – worn of course by Princess Di to the polo in 82, and by me a year before that in ‘Puberty Blues’! This year, Romance teamed up with Linda for an incredible tribute to her entire body of work. They delved back into the archive of frocks and came up with new imaginings of the Waratah dress, the Sturt’s Desert Pea slip and they even designed a Ned Kelly outfit using Linda’s fabulous ‘Bush Couture’ prints on taffeta. Linda and Jenny went their separate ways in the early ‘80s and have been doing their own thing for decades. Maybe they were too individual in the first place? Still, they are forever linked in people’s minds, are often mistaken for one another and remain firm friends forty years on. Collaborations can open up wonderful portals of possibilities as these different creative partnerships have proven. By being bold and reaching out to people they admire, Luke and Anna have kept Romance Was Born fresh and ever expanding in its outlook. Perhaps it’s that injection of new blood helps keep them strong? One thing’s for sure, having been introduced to the wonderful world of Waratahs and opal fever by Linda and Jenny, they’ll never be the same again.